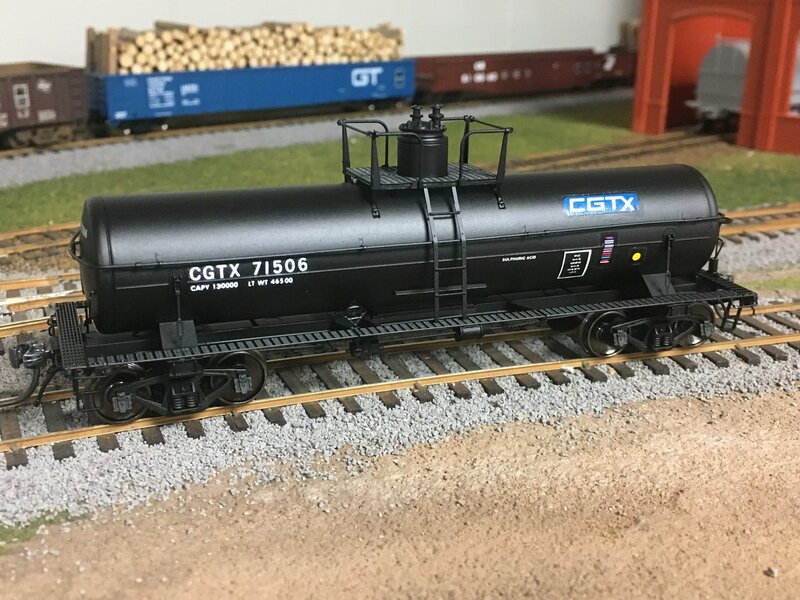 CGTX 71506 is the first addition to my (hopeful) fleet of tank cars for sulphuric acid service. Sulphuric acid is a common industrial chemical and a by-product of ore smelting operations. I’ve posted prototype photos in previous “Freight Car Friday” themed posts of acid cars running over the former ACR, likely from the operations at Timmins, ON or Rouyn-Noranda, QC via the Ontario Northland Railway through Hearst. This model is a Tangent Scale Models car which was purchased as an undecorated/lettered but assembled and painted (black) model. The model represents a General American Transportation 8000 gallon car for acid service built in the late 1940s, but is very similar (identical in size and overall profile with only minor detail differences that you’d only notice if doing a direct side by side comparison of the model and prototype photo) to several older CGTX cars as well, so I was able to use it as a nice stand in. 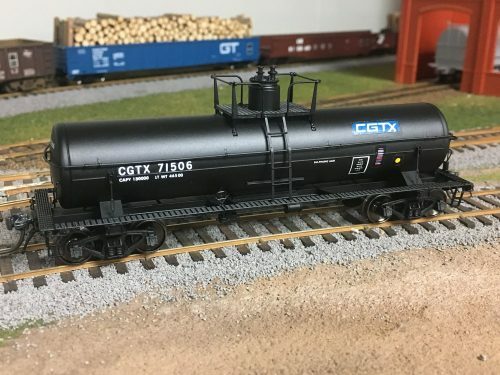 I’m unsure of the exact original build date of the CGTX cars but they would be from the same period – late 1940s-early 1950s and with railroad cars having about a 40-year lifespan, it’s plausible to be running out its last miles in the mid 1980s. I didn’t actually change any details but just lettered the car following a late 1970s prototype photo with an old Herald King CGTX tank car decal set, with some additional detail lettering and COTS, ACI and U-1 decals to bring it up to a 1980s appearance from various Microscale sheets. With a little bit of in-service weathering, this car’s appearance will be completed and it will be ready to haul loads of acid from the smelters to industrial users in the central/mid-west USA. 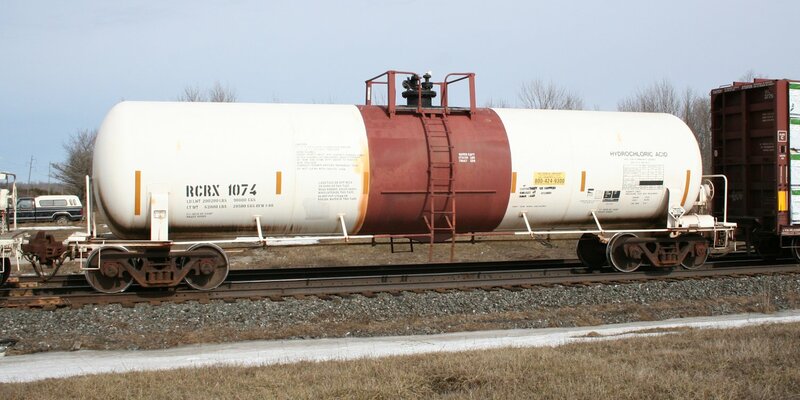 TILX 16265 is an example of a typical tank car in limestone (calcium carbonate) clay slurry service. This particular car is one of a 100 car series built in 2000 by Trinity Industries and leased to Omya, a major producer of industrial minerals. However, the car seen above is one of a pair of cars photographed in Sault Ste. Marie in July 2015 – eight years after the mill in the Sault was permanently shut down – and headed north over the former ACR line. An educated guess as to it’s destination would be one of the paper mills on the CP line along the north shore of Lake Superior or Thunder Bay region, via Franz. 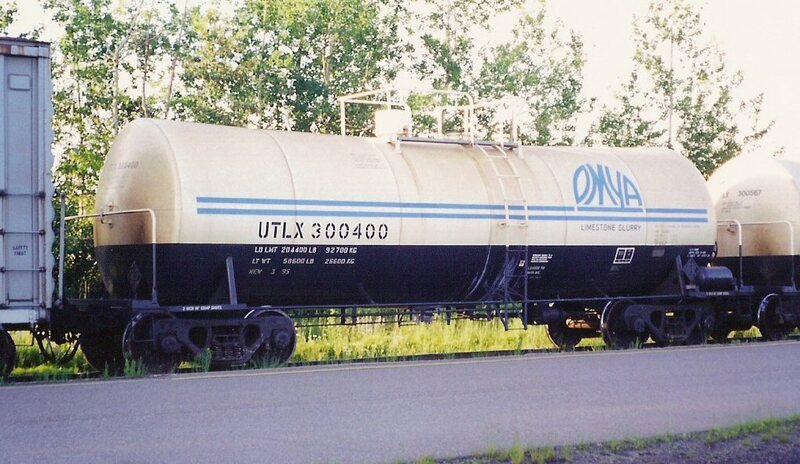 UTLX 300400 below is a similar sort of car built by 1995 by Union Tank Car, and photographed in Sault Ste. Marie in June 2000. Continuing the theme of chemical tank cars on the Algoma Central is CGTX (GATX Rail Canada, formerly Canadian General Transit) 15941, one of a pair of tank cars in sodium hydroxide (also known as caustic soda) service passing northbound through Hawk Junction on train 573/571 on July 13, 2015. A common use for sodium hydroxide is in the pulp & paper industry; the likely destination for this pair of cars is one of the pulp mills served by the Canadian Pacific along the north shore of Lake Superior, via the interchange at Franz. Another common industrial acid is sulphuric acid – indeed it is probably one of the most common industrial chemicals shipped by rail. Uses of sulphuric acid are almost endless, but include chemical digestion of wood fibers for paper making and the production processes of fertilizers and numerous other chemicals including hydrochloric acid (as seen in last week’s Freight Car Friday). Sulphuric acid is often produced in massive quantities as a byproduct of the smelting and refining of metal ores. Based on the (lack of) compression in the truck springs this and the neighbouring white PVCX acid tank car are heading north empty, for interchange to the Ontario Northland for furtherance to the copper/zinc smelter at Noranda, QC. Same car two days later at Hawk Junction July 14, 2013, continuing its progress northward. Hydrochloric acid is a commonly produced industrial chemical that has applications in many chemical and industrial processes including steel making. In steel mills it is used to remove rust, scale and other surface impurities from finished steel. While the car above was not photographed on the Algoma Central, it is representative of a common type of car in hydrochloric acid service. (Note that the Athearn 20,900 gal. RTC acid tank car is pretty much bang on for this prototype.) I did see a couple of similar SHPX cars at Hawk Junction, but didn’t get a good photo; I could also see some similar tank cars from a distance in Steelton yard from the Canyon Tour Train. A related byproduct of using hydrochloric acid in the steelmaking process is the production of ferrous chloride as a waste product. This corrosive chemical has uses in water treatment systems, and a CN conductor friend of mine recently mentioned that he occasionally delivers a tank car of ferrous chloride from Sault Ste. Marie to the water treatment plant in downtown Toronto. Ferrous chloride (and related compounds like ferric chloride) is also shipped in tank cars of a similar size and design to hydrochloric acid.